Tamil caption loosely translated: The two men in the background sporting a kudumi – “We are now fashionable (or fashion has taken inspiration from us). No one dare tease us anymore.” from Ananda Vikatan, 1962. I also found this illustration while doing the posts and it made me laugh a little since I *might* have this woman’s hairstyle at the moment. The blouse with a wide V and three quarters sleeves is very late 50s/early 60s. 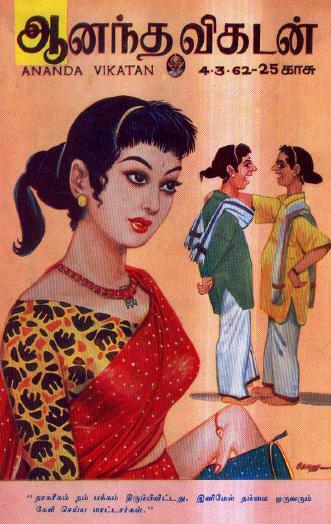 This entry was posted in 1960s, ananda vikatan, fashion, Fashion Quote, Hair, Hairstyles, Illustration, Indian fashion, Indian men, Indian Women, Magazine, retro fashion, retro hair, Sari, Sari Blouse, Tamil, Vintage, Vintage Blouse, vintage hair, Vintage Illustration, vintage illustrations, Vintage Magazine and tagged 1960s, 1962, Ananda Vikatan, fringe, kudumi, retro hair, tamil magazine, vintage cartoon, vintage hair, vintage illustration, vintage magazine. Bookmark the permalink. Your post brings back memories of afternoons in various towns and cities of India that we lived in as kids. The one sustained memory being that of my granny reading Ananda Vikatan short stories out aloud. In fond memory of those delightful stories I am reading a collection of Kaki’s short stories – English translations unfortunately translated by his granddaughter….equally charming, wicked and delightful. OMG! bringing back lots of memories..vintage vikatan! Those vintage covers are amazing!